Everything you want for serious plumbing endeavors at the Industrial & Scientific. 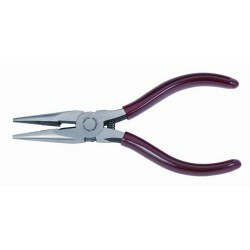 Pliers 5-9/16 W/cutter Stanley-proto  dramatically improved product, you can rely on. Proto is up to date with the strain, newest trends and achievements in the area of safeguard research and development. Our depend on painting supplies could bring out new astounding colors in your world. A Proto® needle nose pliers with induction hardened cutting edges, diamond serrated jaws, coil spring, and comfortable plastisol grips. There is something surprising here for everyone, browse our choice. Products are provided at affordable prices, but without any compromise on quality. You can find remarkable solutions for the problem at hand, something to meet your needs. We take an idea of online shopping even further. Find a huge variety of similar nicely priced products bellow. If you have any questions, don't hesitate to contact our Customer Service department, after all, they are here for you. For a large variety and more related commodities, please visit other sub-categories for anything you need.